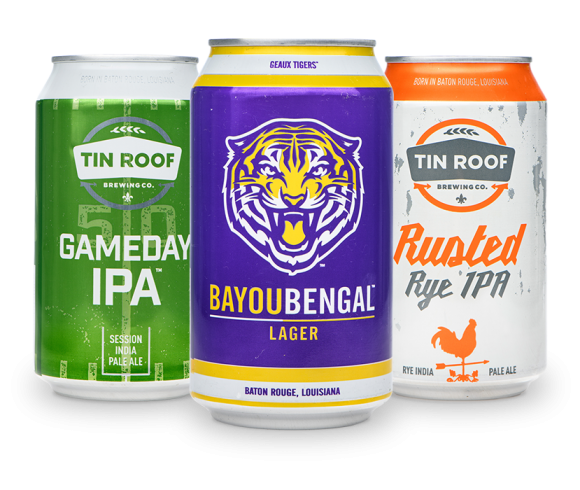 Everything You Need to Know About Rusted Rye IPA’s Release | Tin Roof Brewing Co.
As most of you know by now, we are releasing a delicious version of our seasonal beer Rusted Rye IPA tomorrow starting at 2:00pm. Rusted Rye is a clean, citrusy IPA featuring rye to add a complex spiciness. At a modest 55 IBU, 6.5% ABV, and with flaked rye to add body, this beer retains the perception of balance. Classic Centennial, Cascade and Columbus hops provide citrus, pine, and subtle spicy notes to accentuate the rye character. To be clear folks, we are releasing it exactly on the dot at 2:00pm. Our doors will open at 12:00pm as per usual, but Rusted Rye will not be available until 2:00pm. We’re gonna make ya wait for it! A few of you have already called to ask for more details about the wings. So here they are: the wings are being smoked, fried and battered. We will have three different wings station. Two of our chefs will be making chicken wings and one of our chefs will be making pork wings. The generous chefs that will be handcrafting our wings are Sean Rivera, Alex Barbosa and Richard Markert and they have agreed to donate all of their proceeds for charity. The wings cost just $5 for five wings. Why are we donating so much of our proceeds from this delicious beer to charity you ask? If you didn’t know, our owner and founder William McGehee was just named Baton Rouge’s Young Businessperson of the Year and one of the charities near and dear to his heart is the Boys and Girls Club. When the children in our community benefit so do we, so a majority of the funds from tomorrow’s event will go directly to the children of Baton Rouge’s Boys and Girls Club. But what if it rains? Never to fear friends, if it rains we’ll be putting our bands, vendors and food inside on the brew floor which has PLENTY of room! We can’t wait to see y’all tomorrow and do a good thing for our community. You can even donate ahead of time!